When brokers or brokerage firms make risky, unorthodox and sometimes illegal investments that result in avoidable loss, the investor becomes a victim of broker mismanagement or abuse. 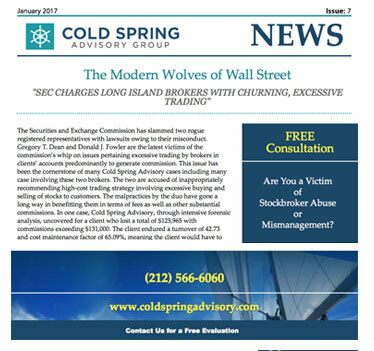 Cold Spring is a stock loss recovery consulting firm specializing in reviewing, analyzing and preparing claims of stockbroker mismanagement and/or abuse. We offer a free evaluation of monthly brokerage statements and trade confirmations to look for evidence of abuse such as churning for commissions, over concentration, unsuitability, excessive margin, unauthorized trading and other violations. After our initial analysis, we review our findings with you and advise you on the strength of your case. If you decide to retain Cold Spring to assist you in recovering your losses, we will perform expert case preparation, certified forensic analysis and provide expert witness testimony to ensure you have the strongest case for maximum recovery.